[160 Pages Report] The increasing demand for valves in oil & gas and power industries is expected to be a major driver for the industrial valves market in Africa. The industrial valves market is projected to reach $10 Billion by 2019, at a healthy growth rate of 5.9% between 2014 and 2019. The market for oil & gas is estimated to be one of the fastest growing markets for industrial valves from 2014 to 2019. The market was segmented on the basis of function, type, and closure type in terms of value. The market segments by closure type include quarter turn, multi turn, and check. The market segments for valve function include control, isolation, check, and special. The valve type segmentation includes market size of ball valves, globe valves, plug valves, and others. The report provides a full analysis of key companies and competitive analysis of developments recorded in the industry during the past four years. In the report market drivers, restraints, opportunities, and challenges of the market are discussed in detail. The leading players in the market such as Pentair Ltd. (Switzerland), Flowserve Corporation (U.S.), Emerson Electric (U.S.), and FMC Technologies (U.S.) have been profiled in this report to provide an insight of the competitive scenario in the African valves market. Product development has been one of the key strategies adopted by leading companies to accommodate the fast changing technologies in the end application industries like oil & gas and chemicals. Companies have also adopted expansion and acquisitions to bridge the existing gaps in their product offerings, the end market requirements, and the geographical constraints. These strategies have been adopted by leading companies to ensure retention of considerable market share within the highly fragmented industrial valves market. Africa is estimated to be one of the fastest growing markets for industrial valves market. Growing demand of petrochemical products like paints, polymers, plastics, and fuel additives is expected to boost the demand for industrial valves. Growth of alternative energy sources as well as nuclear energy for power generation is also expected to drive the demand for industrial valves market. The key players of industrial valves prefer agreements, contracts, joint ventures, and partnership strategies and product developments to garner a larger share in the market. Leading industrial valve manufacturers are focusing on the emerging countries that are estimated to show potential for industrial development in the near future. This report focuses on the industrial valves market for the African region. The market was segmented on the basis of closure type, function, and valve type and has been listed below. Industrial valves are devices used for flow regulation and control in piping systems. Valves are used to regulate, start and stop, or control the direction of a fluid or gas, flowing through the piping system. The market demand for industrial valve in the Middle East and Africa market is estimated to reach $10 Billion by 2019, with a projected CAGR of 5.7% in the next half a decade. 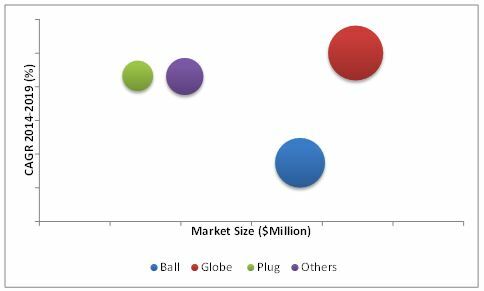 The increasing demand in oil & gas, chemical and municipal applications is expected to be the major drivers for the industrial valves market in this region. The Middle East region is increasingly expected to transform from a raw goods supplier to a refined product provider. This changing trend would be corroborated with the increase in the number of manufacturing and process industries. The industrial valve market is expected to be driven by the demand from these industrial expansions. 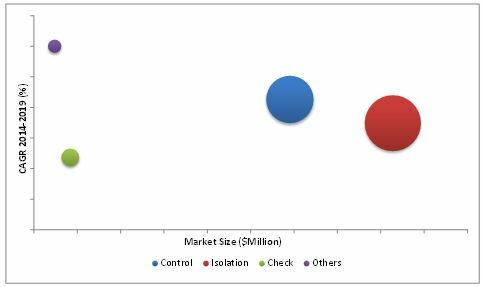 Growing desalination market is another significant factor that would boost the demand for industrial valves in this region. The industrial valves market is estimated to grow with the growing oil & gas industry in the northern parts of Africa, as well as the growing nuclear and renewable energy sectors in the African power industry. Other sectors that are estimated to drive the industrial valves market include water and wastewater application in the municipal market and the petrochemical industry in the chemical market. The study on industrial valves market for Middle East and Africa classifies on the basis of function, type, and closure type in terms of value. The market segments by closure type include quarter turn, multi turn, and check. The market segments for function include control, isolation, check, and special. The valve type segmentation includes market value for ball valves, globe valves, plug valves, and others. On the basis of application, industrial valves market has been categorized into Oil & gas, Chemical, Municipal, Power, and Mining and others. Africa is estimated to be one of the emerging markets for industrial valves market. The key players of industrial valves prefer agreements, contracts, joint ventures, and partnership strategies and product developments to garner a larger share in the market. Product innovation is one of the most adopted developments by majority of companies in the valve industry. Some of the leading players in the market such as Pentair Ltd. (Switzerland), Flowserve Corporation (U.S.), Emerson Electric (U.S.), and FMC Technologies (U.S.) have been profiled in this report to provide an understanding of the competitive scenario in the Middle East and Africa valves market. These leading industrial valves manufacturers are focusing on the emerging countries that are estimated to show potential for industrial development in the near future.